Should a City Transportation Plan Seek to Reduce Traffic Congestion? I’m proud to say that I live in Boulder, Colorado – a city admired around the nation for pursuing progressive objectives. …induces “low-value” car trips (i.e., using the car to buy a cup of coffee). …results in an increase in toxic air emissions (despite the conventional wisdom that claims free-flow reduces emissions) due to the induced low-value trips. …informs the City of Boulder and its citizens that it is useful to maintain or increase road and intersection capacity, even on roads and intersections that are too big already. This problem has been common in Boulder for a number of years now. While the City tends to steer clear of road widening, it has approved the construction of double left turn lanes at many urban intersections (see note below about double left turn lanes). Engineers are particularly eager to create such oversized intersections because enlarging intersections is much more effective in reducing congestion (at least for a brief time) than adding more travel lanes to a road. …strongly discourages road diets (removal of one or more lanes from a road). This despite the fact that road diets are a powerful way to achieve a number of Boulder objectives, such as adding bike lanes and on-street parking, creating more sidewalk and streetscape space, slowing cars, significantly reducing pedestrian crossing distances, dramatically improving safety, significantly reducing severe car crashes, improving retail and residential health, reducing air emissions and fuel consumption, reducing low-value (and regional) car trips, reducing maintenance costs, increasing civic pride, reducing speeding, and improving overall quality of life. 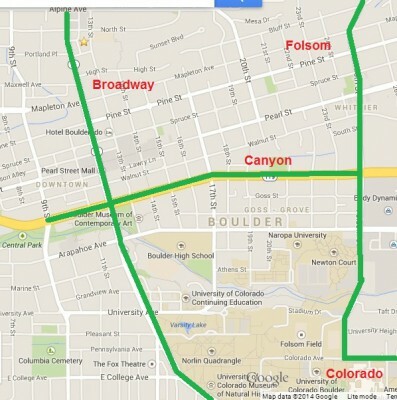 See map below of a possible road diet vision for Boulder. …puts far too much emphasis on what James Howard Kunstler calls “happy motoring.” Too often, free-flowing traffic is considered a key way to achieve urban quality of life. 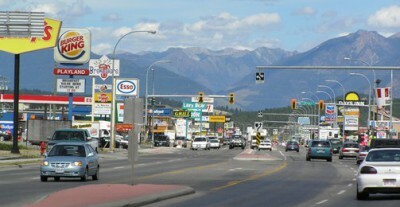 However, free-flowing traffic undermines quality of life in a number of ways. By putting free-flowing traffic on a pedestal, so to speak, or placing such travel in an exalted, privileged position, the City is strongly promoting car travel, and such a car-centric focus is rightly the antithesis of what Boulder is about. …promotes use of conventional methods of maintaining free-flowing traffic, such as intersection widening, which are so costly that other important transportation needs for bicyclists, pedestrians, and transit users are starved of funding. …promotes car dependency, which is an engine for high-speed car travel, suburban sprawl, regional car trips, and low-density land uses. By contrast, healthy town centers are slow speed. And compact, vibrant, sustainable cities avoid sprawl. Free-flowing traffic also reduces travel choice, as walking, bicycling, and transit become less pleasant and less safe when car travel is free-flowing. Most every change in behavior that a citizen engages in when responding to traffic congestion – such as avoiding rush hour driving, living closer to daily destinations, driving slower, traveling on non-major streets, trip chaining (combining, say, a trip to get groceries with a trip to the doctor), foregoing low-value car trips – is good for the community. By contrast, many (most?) actions a government agency takes when responding to traffic congestion – such as widening a road or intersection, downzoning in the town center, adding more free parking, synchronizing traffic signals for car speeds, converting a two-way street to one-way – is undesirable for the community. Because cars consume so much space (a person in a car consumes 17 to 100 times as much space as a person not in a car), only a relatively small number of motorists are needed to congest a road. That means that any reasonably attractive city has a traffic congestion “problem,” and any city without a congestion “problem” may have something wrong with it, as it may be a sign that the city is too feeble or sickly to have even a handful of citizens traveling on a road at the same time. Traffic engineers commonly claim that such intersection “improvements” as adding a second left-turn lane will reduce greenhouse gas emissions by reducing congestion, and believe a double left turn does not conflict with the transportation plan objective of promoting pedestrian and bicycle trips. In contrast, I believe that double-left turn lanes will increase emissions and willreduce pedestrian and bicycle trips. Double left turn lanes have been shown to be much less effective than commonly thought even if we are just looking at car capacity at an intersection. This is because adding a second left turn lane suffers significantly from diminishing returns. A double left turn does not double the left turn capacity – largely because by significantly increasing the crosswalk distance, the walk cycle must be so long that intersection capacity/efficiency (for cars) is dramatically reduced. …destroy human scale and a sense of place. …increase per capita car travel & and reduce bike/ped/transit trips. …increase GHG emissions & fuel consumption. …induce new car trips that were formerly discouraged. …discourage residential & smaller, locally-owned retail. Boulder needs to draw a line in the sand: Impose a moratorium on intersection double-left turn lanes and eventually remove such configurations – particularly in the more urbanized portions of the region. Double-lefts are too big for the human habitat. They create a car-only atmosphere. Healthy town centers need to be slow speed, compact, walkable, and human-scaled. In part, that means that roadways in the town center should not exceed three lanes. In Seattle WA, road diets resulted in such obviously beneficial outcomes for businesses and residences along the dieted streets that those on two other arterial streets asked for the road diet treatment on their street. Overall, Seattle has completed over 30 road diets, according to Peter Lagerwey. The following street sections in the Boulder town center exceed that size and would benefit from a road diet. 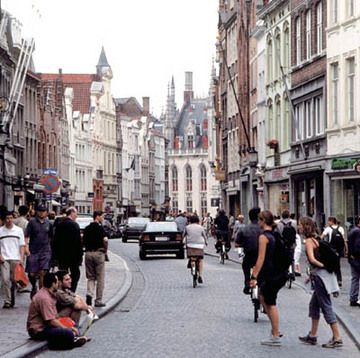 We all know that an attractive city – particularly its town center – will attract people. In healthier, more pleasant cities, the number of people drawn to a city – particularly its town center – will lead to an ambiance that is more festive, convivial, and enjoyable. Humans tend to be sociable by nature, which means that many seek out places that entice a gathering of people. A place to “see and be seen.” A place where we can expect to serendipitously bump into friends as we walk on a sidewalk or square. A place where we can share the news of the day and linger with our fellow citizens. Or share a laugh or an idea. A place that at times creates a “collective effervescence” of people enjoying experiences with others. A place, in other words, that is likely to be rewarding. Indeed, the prime reason for the creation of cities throughout history is to promote such exchange. Exchanging goods, services, synergistic ideas, and neighborliness is the lifeblood of a thriving city. While larger amounts of people in a gathering can — for some — feel “crowded,” when large numbers arrive in space-hogging cars, conditions are particularly likely to seem undesirably “congested” – even with a relatively small number of people gathering. Striving to reduce congestion in the Boulder Town Center, as the Boulder TMP does, is therefore to work at cross purposes to what we seek and should expect and exalt as part of a strong, vigorous city. Widening roads and intersections to “smooth traffic flow” and reduce congestion is akin to the many engineers in the past who fervently believed that it was necessary to convert streams into concrete channels in order to smooth water flow and reduce flooding. Today, we recognize that doing so destroyed the stream ecosystem and made flooding worse downstream. It is time for us to realize that at least in town centers, widening roads and intersections will destroy the human ecosystem and make congestion worse. In 1985, Florida adopted a growth management “concurrency” (or “adequate facilities”) law that prohibited development if the proposed development reduced “level of service” standards adopted by the community for such things as parks, potable water, schools, and road capacity. The law seemed highly beneficial when enacted, for obvious reasons. It was also an important tenant of the law that to fight sprawl and promote community objectives, in-town development should be encouraged and remote, sprawling development should be discouraged. But many soon realized that there was a significant unintended consequence with the growth management law. The “concurrency” law, when applied to roads, was strongly discouraging in-town development and strongly encouraging sprawl development. When the State of Florida decided to allow “transportation exception areas,” it specified that such exception areas would only be allowed if certain design, facility and service conditions were in place. To adopt transportation exception areas, the community had to show that it was also providing a full range of travel choices – choices that were available for those who wished to find alternatives to driving in more congested conditions. Boulder could consider adopting a similar approach. For example, the congestion exception I’m suggesting above for the Boulder Town Center could be coupled with a rule that requires that the exception is only granted to proposed development if the development provides design enhancements beyond those already required by Boulder. Such enhancements might include one or more of the following requirements: That the new development provide more bicycle parking. Or provide eco-passes for employees or residents. Or place the front building façade up against the streetside sidewalk. Or provide a mix of uses. Or provide cross-access routes to ease pedestrian travel — among a great many other possible design enhancements. Given this, sustainability and financial health requires that Boulder avoid assuming that all trips are equally high in value when it comes to managing congestion. There are much cheaper and more fair ways to managing congestion than by spending many millions of public dollars to widen a road or intersection as a way to accommodate car trips to the coffee shop at rush hour. The most admirable, beneficial principle in the update of Boulder’s Transportation Master Plan is that the pedestrian comes first in community design – before cars, before transit, and even before bicycling. By making the pedestrian the design imperative, Boulder properly asserts that the pedestrian is the key to quality of life. If our community – particularly our town center – gets it right for those on foot, a great many community objectives inevitably fall into place. The congestion objective in the Master Plan elevates the comfort and convenience of the car to be the top concern in the community, and doing so — again — works at cross-purposes to a great many critical community objectives. The community devolves into a downwardly spiraling road to ruin. It is time to return to the tradition of the ages: Building our community to make people happy, not cars. Hometown Democracy: Should We Give Citizens the Right to Vote on Proposed Development Projects? I worked as a long-range town planner for 20 years. In 2007, a constitutional amendment was advanced in the state of Florida that would give citizens the right to vote on whether they approve of or disapprove of a proposed development in the community, or a proposal to change the zoning or land use designation of a property. On the surface of it, such a form of direct democracy sounds like a great idea. Over the past several decades in America, even town center residents (who live in a relatively dense, compact, mixed use location) have regularly been angry opponents of infill development in very appropriate locations. Predictable for two reasons. First, because nearly all development that has occurred over the past century has been awful, car-based schlock. And second, because when one lives in a world of massive subsidies for car travel and suburban sprawl, the citizen concern that overwhelms all others is the single-minded focus on MINIMIZING DEVELOPMENT EVERYWHERE. The citizen must plead for this because nearly all Americans live in dispersed, low-density, single-use locations that require car travel for nearly every trip. This means that the number one priority for most Americans is minimizing density (or opposing any form of new development) everywhere (including in the relatively dense town center, where compact development is most appropriate and desirable). Because cars consume space so voraciously, car travel becomes dysfunctional and nearly intolerable with even a relatively small population. The level of frustration goes up exponentially when the neighborhood population increases, because there will now be even more people consuming enormous amounts of road and parking space! Therefore, if one is compelled by community design and government subsidies to drive everywhere, the only possible community design agenda is to angrily oppose density increases (or any new development) every time it is proposed – and no matter where it is proposed. I am (but shouldn’t be) astonished by how many times I’ve seen even town center neighborhood residents fight like the dickens to oppose new development (and the fear that “spillover” parking by the new development will take away “our” neighborhood parking) in or nearby the neighborhood. Again, this is predictable in a society where car pampering — and the extreme car dependence that results from such artificial promotion of the car — means that nearly all of us have a vested interest in fighting to stop new development. The same sort of negative citizen response regularly occurs if there is a proposal to change the zoning or land use of a property within the community. After all, one would think that the adopted land use and zoning plan for a community is designed to promote quality of life. It therefore seems wise to “follow what the community long-range plan specifies for land use and zoning designations,” instead of letting some “greedy developer” harm the community plan by selfishly changing such designations. However, city and county land use and zoning maps don’t tend to be a “plan” at all. For nearly all communities, the adopted land use and zoning maps are not designations chosen by planners, citizens and elected officials to achieve a better quality of life. Rather, such maps tend to merely adopt what is on the ground already. If an area has low-density residential development, the map will specify “single-family” for that area. If another area has offices, the map will specify “office” for that area. It is a spineless, leadership-less way of memorializing what already exists. No thought whatsoever went into an evaluation of whether certain parts of the community should evolve into a different land use pattern to achieve community quality of life objectives. Maybe once or twice in my 20 years as a town planner did my city meaningfully propose a land use that differed from what was on the ground already. In the early years of our nation, Thomas Jefferson pointed out that a healthy democracy depends on an educated electorate. I don’t believe he wanted the direct democracy envisioned by giving citizens the right to vote on proposed developments or proposed changes to land use or zoning designations. I don’t think that direct democracy is at all workable – logistically – nor do I think it improves decision-making. Indeed, particularly when there is little citizen education, having large numbers vote inevitably dumbs down decisions when lots of uninformed people are able to vote about complex societal decisions. Are we comfortable with the idea of dumbing down community design decisions? What sort of future can a community expect if citizens are given the such “direct democracy” power, and use it in a short-sighted way? A way that is now unduly, artificially distorted by car pampering, which leads most citizens to desire low-density sprawl and happy car travel? Won’t that lead to decisions that leave a community without a “Plan B” when faced with extreme climate change or peak oil problems? A community, in other words, without the resilience to adapt to a changing future? A community that suffers significantly because it did not plan for land use and transportation patterns that would reduce costs and provide options when the price of low-density land uses and car travel become unaffordable? An important concern with the direct democracy of citizens voting on proposed development or proposed land use changes is the risk of driving development further out into the countryside, away from existing town centers. As I look around the nation over the past several decades, this sort of sprawling is already happening – even without the added boost of citizens voting for more sprawl. When I see remote subdivisions sprouting up like weeds, all I can think about is how we are paying for the ugly sins committed by our forefathers and mothers who were part of a pro-car generation. We are still embedded in that pro-car world. A world where the price of car travel is substantially hidden from us, so we drive more than we would have without such a clouding of our awareness. A world where we feel it is necessary for us to vote for nest-fouling, pro-car, pro-sprawl decisions because we are trapped in car dependency. In the end, we have become trapped in being our own worst enemies. I am firmly convinced that representative democracy works better than direct democracy – particularly in larger, more complex societies such as ours. Most citizens do not have the time, interest, or wisdom to be sufficiently knowledgeable about community planning or transportation issues that must be decided upon. Despite all of the above, I must admit that I have some sympathy for direct democracy applied to planning and transportation decisions to the extent that the amendment is an expression of unhappiness about the long parade of awful car-centric road projects and strip commercial sprawl developments that have occurred in American communities so frequently since the 1940s. I would have loved the opportunity to have been able to vote against the monster highway widening projects and massive shopping center developments that have been built in my community (and using public tax revenue to boot). So in a sense, I am sympathetic to the idea of applying direct democracy to town planning. But overall, I believe the idea does more harm than good. It is a sledgehammer that wipes out the good with the (admittedly) bad. Examples of good? Increasingly, developers and property owners are proposing high-quality, sustainable projects because there is growing evidence that compact, mixed-use development that promotes a higher quality of life, an affordable lifestyle, and transportation choice is the most profitable way to go. In part, this is due to the emerging Millennial Generation, which seeks more of a lifestyle that is based more on town center living and reduced use of car travel than previous generations. And in part, it is due to price signals and growing concerns about a sustainable future in a world where unstable energy and climate change are making a car-based lifestyle seem increasingly inadvisable. By killing good and bad, we are left with the status quo, which is awful in so many instances (every American community is infected by unlovable, unsustainable, strip-commercial sprawl). We NEED developers and property owners to propose projects that will heal such car-happy insults to our quality of life.